As USA TODAY, The Nation's No. 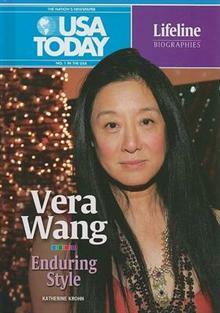 1 Newspaper, put it, Vera Wang is hot?? ?.She oversees everything. The name Vera Wang has become synonymous with simple, elegant design. Her wonderfully styled gowns drape and flow to make the wearer look her best. Her casual clothes beautifully combine comfort and function. But who's the person behind the brand? Born to wealthy Chinese parents, Vera Wang learned about high fashion at an early age. After many years as a Vogue magazine editor, Wang embarked on her own design career, starting with unique, stylish wedding gowns. Her attention to detail and understanding of a bride's needs made her a must-have designer among the rich and famous. Eventually, she spread her wings to include gala attire for Hollywood events, china, crystal, stationary, perfume, low-priced ready-to-wear clothing, and even mattresses. What will this designer and entrepreneur pursue next?